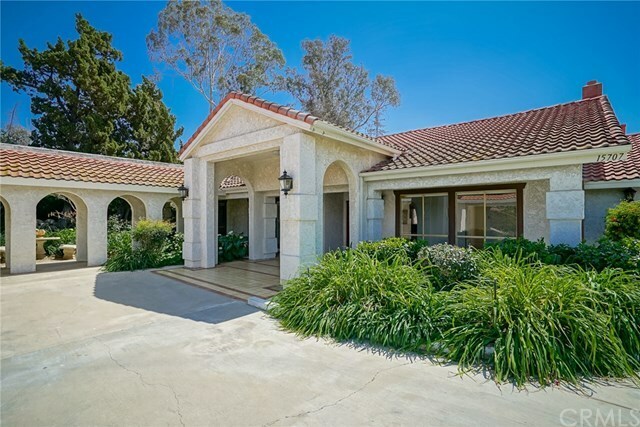 This Amazing Spanish Style home has been lovingly cared for by one owner. Located on a cul-de-sac with a gated entry, this home is perfect for all who love to entertain. Enter through the double doors to a beautifully appointed marble foyer, with an adjacent formal living room and separate dining room with custom chandeliers, light fixtures, fireplace, marble flooring and an abundance of natural light. There is also a music room with a custom chandelier that can also be used as additional dining space. The entire home has been freshly painted. The kitchen has plenty of counter space and separate eating area that opens to the oversized family room with picturesque windows and french doors that lead out to the courtyard. The master suite consists of 4 mirrored wardrobe walk in closets with some built in features, 2 separate vanities, a fireplace. All secondary bedrooms are oversized with one that has a built-In bookcase. There has been attention to detail throughout this home with additional features to include, a separate laundry room with sink, new HVAC, marble fireplace mantles, fountain in rear courtyard, large and private backyard with low maintenance grounds, a separate sport court, flush lighting under arches, 2 car garage with additional carport & a studio/storage room. The breath-taking views will call you home as the indoor and outdoor blend together in perfect harmony to create an amenity- rich residence. Selling Office: 168 Realty Inc.